A couple months ago, I finally got my very first iMac. It has been by far one of the best investments I have made in my life! I no longer have to work off a tiny 13″ MacBook Pro on the regular. Editing photos and designing blog posts have become so much easier! After taking my new baby home, I knew the next step was to create a lovely office space. I began to shop affordable, yet stylish and chic office essentials. I like to keep my space pretty minimalistic, but for a few months, the walls were awfully bare. Even after I got my new desk and some fun props like a delightful candle and fresh blooms, I knew I needed something more — something that would stand out and make the space more “me.” Perfect timing had it, a Swedish art print & frames company, Desenio reached out offering the opportunity to transform my boring office into something a lot more exciting! I got approximately $200 worth of art prints and frames to decorate my walls with from their online store. As for art prints, they have a wonderful variety of styles and sizes to choose from. I was particularly fond of their fashion collection, where I was able to find a ton of affordable classic prints! 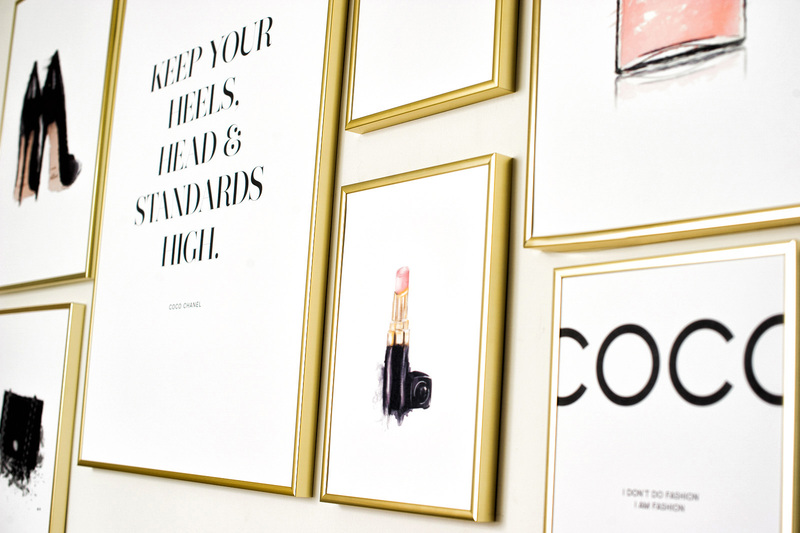 I scored 8 of these lovely prints with dainty gold frames to match the touches of gold on my desk. To keep things interesting and establish a sense of balance, I varied up the sizes and art vs. text prints selected. While I stuck with gold frames exclusively, Desenio offers a plethora of other styles to suit every taste. Some examples include black, white, oak, copper, and silver frames in different sizes. As for the art prints, I tried to pick pieces that went well with the theme of Chanel’s classic saying. 5 things every woman needs: luxurious heels, a Chanel bag, flawless eyebrows and eyelashes, a good lip color, and of course, a signature fragrance. Need I say more? As a young entrepreneur who can’t stay in one place for long, I don’t like to break an arm and a leg to achieve a beautiful work space. Things break and wear a lot quicker when you’re constantly transporting them from one place to another. Don’t get me wrong — as one who works from home full-time, having a nice and comfortable office is essential. I love that with Desenio, I can get my favorite prints without breaking anything! The best part is, their items are of great quality, and did I mention, super trendy? For those of you looking to spruce up your walls in time for the holidays or the new year, I highly recommend checking them out. Whether you’re looking to make your living room cozier or give your bedroom a makeover, you’ll be sure to find something you love on their website. To top it off, they’re currently offering 40% off posters for Cyber Monday, so don’t wait to stock up! Where in your home would you place some new art prints? What a lovely work space you have created! Loving all these art prints. Will definitely have to check Desenio out. Do they ship to Canada? Well done. Inspirational but not distracting. WOW, your office space is absolutely beautiful!! I’ve never heard of Desenio, but I definitely have to check them out! I’m also thinking about investing in an iMac, it makes everything so much easier! Thank you so much for sharing and have a wonderful day! What a beautiful little space. I want to come and work there! wow, your office space looks so nice with the new artwork!! its classy and not overbearing 🙂 I’d definitely want to work at home if this was my workspace ! Thank you Samantha! That was totally what I was going for so I’m glad you think that way! You have such a gorgeous work space! Must be perfect for blogging amd staying inspired! Love those prints! 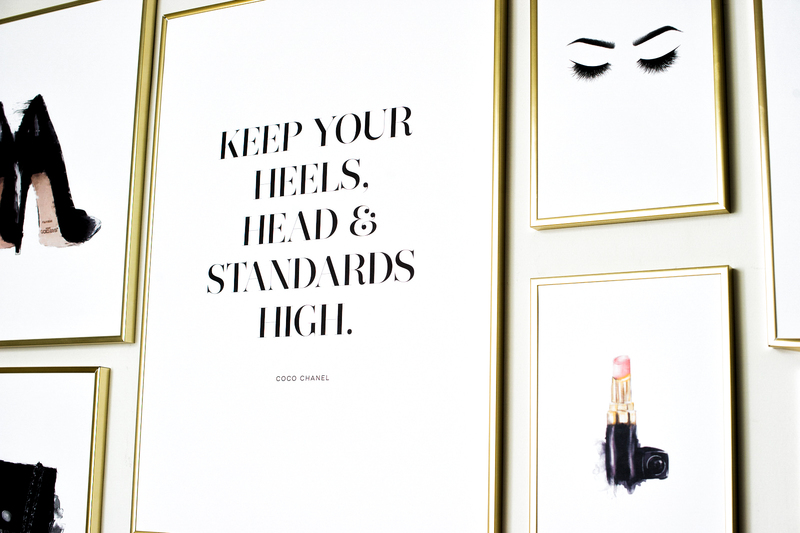 As a graphic designer myself I can only agree that affordable prints are the best way to brighten up a work space! Bravo! I absolutely love how you decorated your space! I have been wanting to form a little gallery wall over my desk space for really long time now. I will have to check out this brand because it looks like they have some really cute and affordable products – thanks for sharing! Yes! Desenio is the perfect one-stop destination for all your art prints in and out of the office space! omg you are so clean and organized love your space! Congrats on buying an imac !!! I also love all the prints you picked out 🙂 The quotes are so motivating ! Beautiful work space babe!! You did an amazing work here. I also love the quotes. so inspiring. Love this post! Love these new pieces babe! Your work space turned out beautifully… I love the clean look it has to it 🙂 Have a great week hun! Thanks Jessi! Glad you like it! I am absolutely in love with your new office! It’s super chic and simple which is so me! My favorite wall quote is the Marc Jacobs! This is the most beautiful space!!!! I love everything about it. YES I’m definitely loving my Swedish prints haha! You people have the best taste! You’ll have to show me your amazing office space when I’m in town next year! Those prints look so amazing and I’ve been meaning to get a desktop but just haven’t gotten around to it!! Can you decorate my office? Haha! Your office space looks wonderful! I love all of the gold frames, they’re so chic and classy. Having a defined workspace that inspires you feels really nice. Thanks Christine! LOL! So… I originally bought the ukelele to learn how to play… but ugh, I can never seem to find the time to consistently learn and practice… so for now, it’s become a nice decoration LOL! Omg I LOVE it. It’s so pretty and sleek! 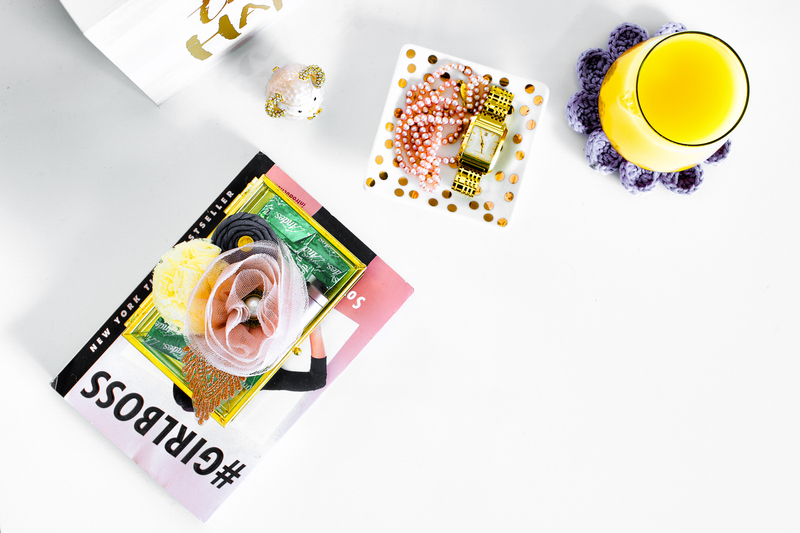 What a chic office space you (and your boyfriend) created! Your taste in everything just amazes me everyday, Sharon! 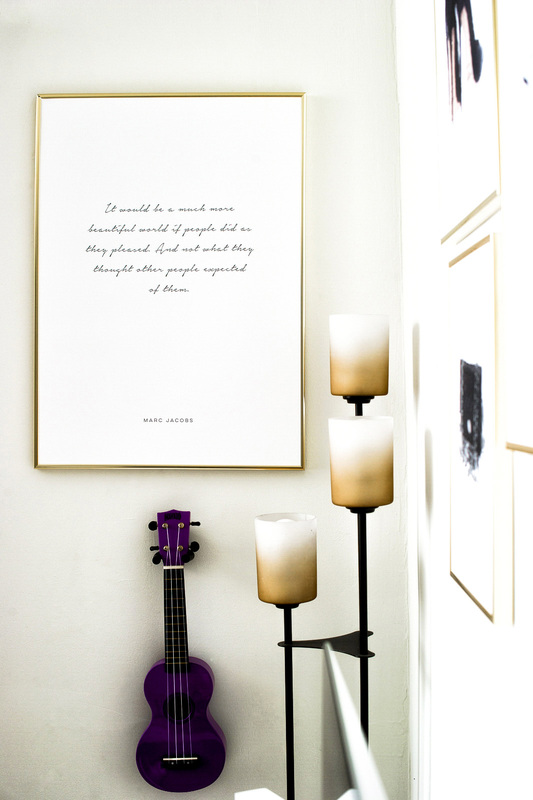 I can’t believe you only spent $200 for all these beautiful wall arts with such awesome quotes!! I need to check out their store and get some for my house! I love it! Ive been looking for some great art prints to decor my house!! Desenio has a great selection for you to choose from! I love this post. I am in the process of building a new home, and one of my first questions is how should I design my office space. Thanks so much for the wonderful inspiration. This is the dream office! Definitely taking some inspiration for my future space!!! The redesigned office space looks so good here! I feel like having a clean, lovely designed office space really helps with the productivity level when you work. It keeps your head in the game and ahh.. you made this space so pinterest worthy and pretty! I need to get some wall art for my little corner actually. 🙂 I’ll definitely check out Desenio. My office needs to be crisp and clean – looks like your’s is the same way. Wow, I am absolutely in love with the pieces you chose and how you arranged them in your office space! Looks like the perfect spot to work! Wow babe – Love this space. Your content is always so inspiring. I am obsessed with that Marc Jacobs print! Need asap! Love all the artwork — it’s so pretty and so unique! What a beautiful space you created! What a beautiful space girl, I love that art work! Yay for your new mac too, it is SUCH a game changer! Thanks Darci! It really IS a game changer! You have the beautifulest home office decor! I love the framed tygraohy and illustrations. Very Blaire Waldorf! And that perfect colour scheme to boot! Those are literally two of my favorite quotes too! I have so many but these are definitely in my favorite list! I’m about to be like you and get myself a desktop to work on! I just need to find a space to set it up! I love how you decorated it! It’s my dream workspace! One day when I have space to do this, I definitely will use this! Wooooowww!!! Those prints are sooo beautiful, honey!! I am just swooning over here!! The quality of them is just stunning & how true are those quotes?! Great office decor altogether <3 Love love love it!!!! I love your pretty and minimalistic new space! Your office looks great, I love all of those prints! I’m obsessed with this Sharon! I LOVE the prints you chose, and they look gorgeous in those gold frames. I want to start a gallery wall of my own, so I love the inspiration. Thanks for sharing love! 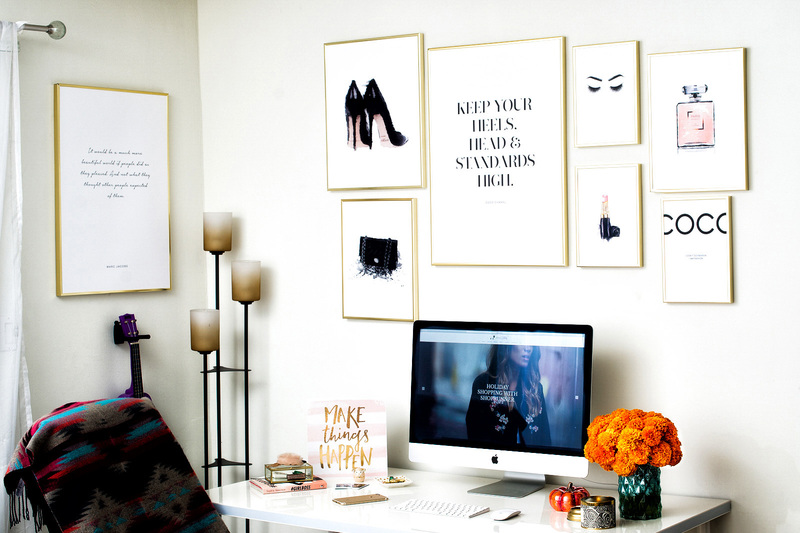 I love this workspace you have created and those quotes are so inspirational! What a beautiful space. Love all the prints. Ah omg I absolutely love your workspace!! I can’t wait for the future when I move out to redecorate and create one of my own. The posters are all motivational and lovely. Hehe thanks for sharing babe! All your choices work beautifully together. Thank you Jenn! 🙂 I’m glad you like it! I love the quotes that you used! Your prints look awesome! Love all of the prints and gold frames! I definitely need to tackle my bare office walls after seeing this! Thanks! Glad I was able to inspire you! Love love love this style! Super cute modern accents that would look amazing in my office. Thanks for the inspiration! Hi Sharon! Thanks for sharing. I have been looking for posters for this for a while. I’ll have to check them out. Thank you for stopping by Em! You did a phenomenal job! Great frames too! I just checked out the Desenio website and I’m officially hooked! I was hooked too the minute I saw their prints! Wow Beautiful.I love your space. Thank you so much darling! I’m glad you like my selections! 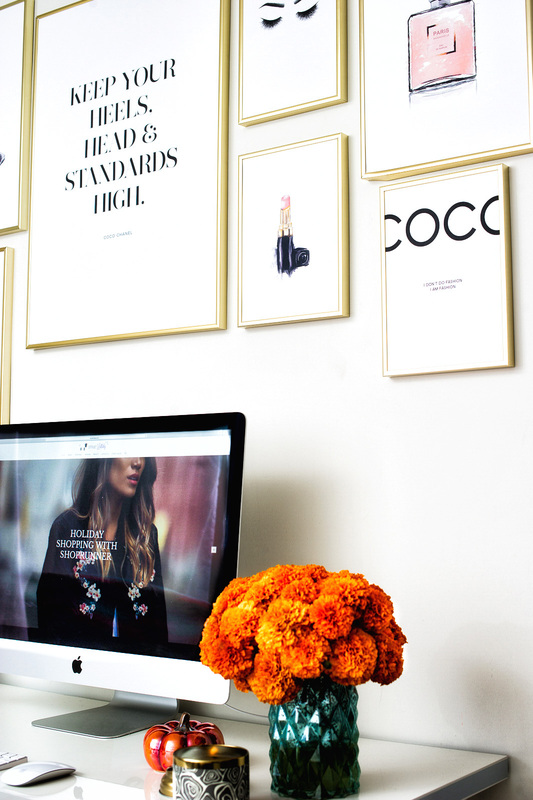 such a gorgeous, chic office space. I love that big framed Marc Jacobs quote. You’ve styled it all so beautifully. Home Decor is my absolute favourite thing to buy, I love seeing everyone’s ideas and being able to see how I can incorporate them in to my own home. SOOOOOO cute! We’ve been trying to figure out what to do with our office/bedroom area for over a year now! Love the inspo quotes and color palette you did! Such a great choice for your art gallery wall! Love the touches of gold. I’ve got one against a grey and white striped wall in my bedroom. It’s got these really gorgeous illustrations by EmmaKisstina, whose fashion illustrations I totally recommend. She even makes what’s in my bag custom prints for you. Your office looks absolutely lovely and I love all your gorgeous prints! What a beautiful way to spruce up some bare walls. Will definitely have to check Desenio out! Aw yay! So glad I could be of inspiration to you! Happy decorating babe, and congrats on moving into your new place! Love the color scheme here! It looks like a relaxed room yet one perfect for focusing and getting girl boss work done! Love how you redesigned it! how fun! i love collecting art work and hanging it on my walls. just an instant refresh of the room. Thank you Lily! I’m so happy to hear you like it! Such a lovely office babe!! LOVE how you decorated it. Sharon I love this office space SO much!!! This is going to be my inspiration for my own personal office <3 Thank you so much for sharing your decor and congrats on the new office space! 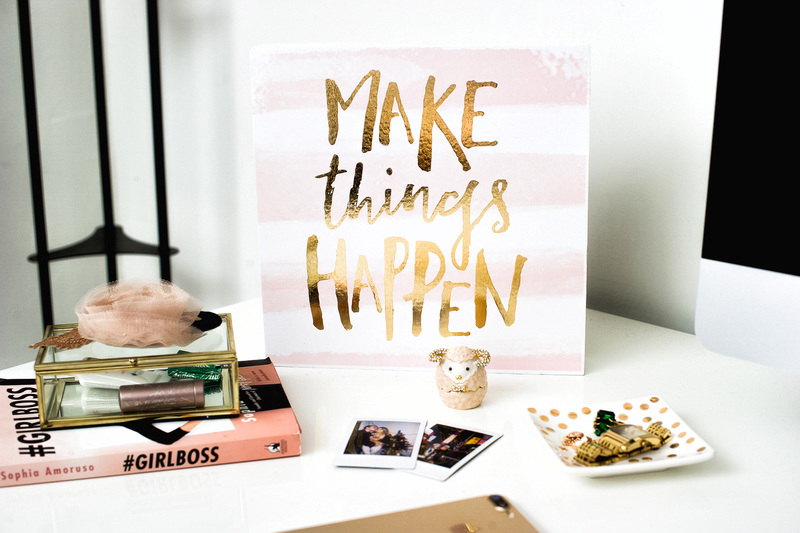 I love the Make Things Happen item. Super cute! Ah thanks! That was from Hobby Lobby! They’ve got great decor items there as well. I love these gorgeous prints. The quotes you chose are perfect. I always love positive sayings and words of wisdom. The closest I have to positive notes on my wall are the dozens of post it notes my hubs surprised me with on my mirror. I’m so grateful for them. I love the sweet scribbles, but would love to get frames like these soon for my desk area! Haha. Have to check them out immediately! Thanks Miki! I’m glad you like the decor! Positive affirmations are everything! I am so jealous of your gorgeous work space! You definitely have an eye for decorating! If fashion doesn’t work out for you could definitely have a career in interior design! Thanks Kyla! Haha for the record, my bf helped me a little! I wish my apartment had better natural light though — I think it would have looked way crisper and whiter. Oh well! Thank you Lauren! Gold is always the right answer haha! I’m so in love with your blog design, keep up the good work!